At long last, whimsical avian adventure Aviary Attorney begins proceedings. The eagle-eyed among you will note that this is four days later than I announced a couple of weeks ago—according to a recent Kickstarter update, a major bug in the save system held the release date in contempt. However, considering that the original release window was late July, a few more days is water off a duck's back. 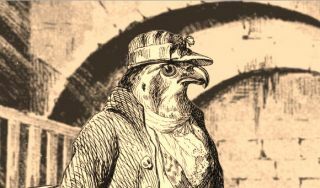 Aviary Attorney follows Monsieur Falcon and his assisstant, Sparrowson as they take on the cases of characters such as bourgeoisie kitten Caterline Demiaou in 19th-century Paris. The rest is Phoenix Wright as drawn by J. J. Grandville, and I mean that literally, because M. Falcon and company were scanned from Grandville's illustrations for Public and Private Life of Animals. Hurrah for the public domain. Retaining Aviary Attorney will cost you £10/$13.